We may be living in the golden age of good beer. According to the Brewers Association, there are more breweries and brewpubs in the United States today than at any point in the past century. And the number is only increasing. In 2014 alone, 456 new microbreweries opened for business in the U.S. That’s more than the total number of U.S. microbreweries in operation as recently as 2008. Needless to say, all of this is great news for beer drinkers. Cooler aisles that were once mostly limited to a handful of generic products from the big two (Miller and Anheuser-Busch) are now overflowing with a diverse selection of craft beer. Better yet, in many cities and towns across the country beer connoisseurs can leave out the middle man entirely by hitting up a brewpub or paying a visit to the local microbrewery – the perfect way to spend a cold winter day. To determine the best cities for beer drinkers1, SmartAsset looked at data on microbreweries, brewpubs and bars for 296 of the largest cities in the U.S. We considered the total and per-capita number of microbreweries and brewpubs in each city, as well as the average Yelp star rating for these establishments. There’s something about Portland. Portland, Maine ranks as the best city for beer drinkers on the strength of its 17 breweries (in a city with just 66,000 residents). The third ranked city is the west coast’s Portland – the Oregon version has more breweries and brewpubs of than anywhere else in the U.S., with 68. Gloomy winters, good beer. As we enter the coldest time of the year, it’s worth noting that many of the cities with the best beer also have the gloomiest winters. Something tells us that isn’t a coincidence. 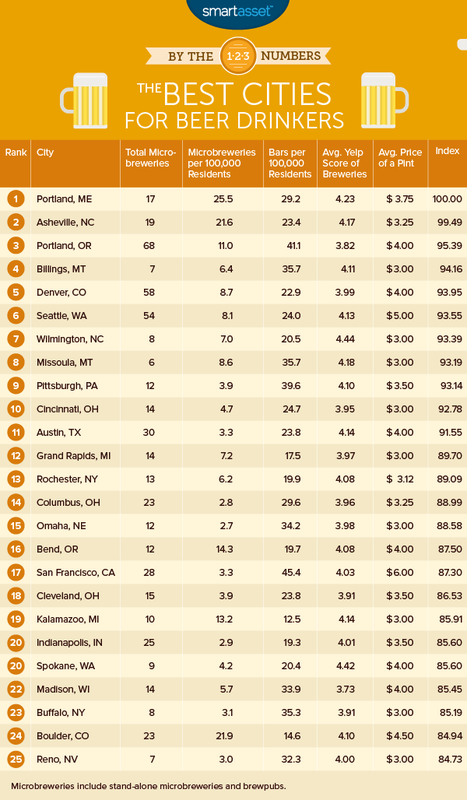 The nation’s top beer city is Portland, Maine. The city is home to 17 microbreweries, one for every 4,000 residents – the highest per capita microbrewery rate of any U.S. city. Perhaps the most well-known of Portland’s breweries is Allagash Brewing Company, which reintroduced Belgian style brews to America in the mid-90s. Other favorites include Peak Brewing Company, which specializes in organic brews, and Sebago Brewing Co., which has several brewpubs throughout town. Moving to NC? Find out what your taxes will be. The microbrewery capital of America, Portland is home to a total of 68 microbreweries and brewpubs, with more springing up every year. The most famous Portland-based craft brewery may be Widmer Brothers Brewing, but other Oregon heavyweights such as Dechutes Brewing (which is based in Bend) have opened up Portland-area breweries in recent years. For those looking to burn off some of those beer-calories while they drink, one of the city’s pedal-pubs might be just the ticket. Powered by beer drinkers but steered by sober professionals, mobile bars from companies like BrewCycle combine two of Portland’s proudest traditions: beer and bikes. Montana’s largest city is home to seven microbreweries. It also has more than 40 bars, or about one bar for every 2,800 residents. That’s the 13th highest per-capita concentration of drinking establishments of any city in SmartAsset’s analysis. This is also a great destination for beer drinkers who are considering an early retirement, as Montana is one of the top states for early retirees. Colorado has a long history of beer production, and the greater Denver metro area (including Boulder and Fort Collins) has earned the name “The Napa Valley of Beer” for its voluminous craft beer industry. The city of Denver itself is home to 58 craft breweries and brewpubs, second most of any U.S. city. There’s no better time of year to enjoy a good beer than in the middle of winter, when days are short and the weather is dreary. Perhaps that’s why Seattle, which has the dreariest winters of any U.S. city south of Alaska, is home to so many high-quality breweries. Visitors to Seattle should make sure to check out the Georgetown neighborhood. The industrial district south of downtown is home to a high concentration of microbreweries, including Georgetown Brewing Company, creator of the popular (and pervasive) Manny’s Pale Ale. Wilmington recently welcomed its newest microbrewery to town, with Waterline Brewing Company joining established breweries like Flytrap Brewery and Front Street Brewery. Together, those beer makers rate as some of the best in the U.S. (according to Yelp users). The average Yelp score for Wilmington breweries is 4.44 stars, one the highest scores of the 296 cities that SmartAsset researched. Thinking of buying a home? Check out our mortgage payment calculator. Located in the mountains of western Montana, Missoula has long and occasionally harsh winters. What better way to enjoy a blustery winter day than at one of the city’s craft breweries? With six breweries serving a population of about 70,000, the city has the 11th highest per capita concentration of microbreweries of any city in SmartAsset’s study. In fact, good beer is such a big deal in Missoula that the city dedicates an entire week to high quality brews. Beginning in late April, Missoula Craft Beer Week celebrates the Garden City’s beer culture with events such as a “human foosball tournament,” blind beer tastings and a beer run hosted by Run Wild Missoula. With one bar for every 2,500 people, Pittsburgh has the ninth-highest concentration of drinking establishments in the country. (The top-rated city on that measure is New Orleans.) It is also home to a number of the nation’s most unique breweries. Hofbräuhaus, for example, is modeled after the 400-year-old brewery of the same name in Munich, Germany, right down to the decor and the staff’s attire. Church Brew Works is a brewpub that uses a restored Roman Catholic church to brew and serve beers such as Celestial Gold, Pipe Organ Ale and Pious Monk Dunkel. The first of three Ohio cities to rank among the top 25 best cities for beer drinkers, Cincinnati has a rich history as a producer and exporter of great beer. That history stretches as far back as the mid-19th century, when Cincinnati emerged as one of the leading producers of beer in the entire country. While much has changed since those early days, Cincinnati is still a top beer city. It has 14 different breweries, including popular microbreweries like MadTree and Rhinegeist. For those who want a taste of the past, the city’s Brewery District offers tours of the pre-Prohibition brewery buildings, some of which are more than 100 years old. Total number of microbreweries and brewpubs. Number of microbreweries and brewpubs per 100,000 residents. Average Yelp score of breweries. Number of bars per 100,000 residents. Average price for a pint of domestic draught beer. We ranked every one of the cities in our study according to those five metrics. We then averaged those rankings. In calculating the average ranking, we gave double weight to the total number of microbreweries and brewpubs in each city, half weight to the average Yelp score of breweries and average price for a pint of beer and full weight to the other two metrics. Check it out: America’s Best College Towns. Those average rankings formed the basis for the overall ranking and index score. The city with the best average ranking across those five metrics scored a perfect 100, ranking first, while cities with lower average rankings garnered lower scores. Data on the number of microbreweries and brewpubs comes from brewerydb.com. Data on the number of bars per 100,000 residence comes from the U.S. Census Bureau. Data on the average price for a pint of beer comes from Numbeo.com. Data on the average Yelp score for breweries comes from the Yelp API. Note: This Article was published December 28, 2015. 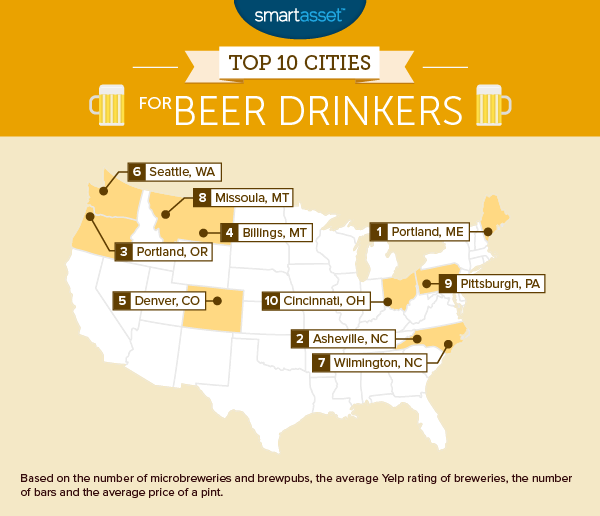 Read the 2016 version of SmartAsset’s study of the best cities for beer drinkers. 1. These cities are great places for the beer drinkers who live there, but they’re equally good places to visit for a day or a weekend. Many of the cities on the list even have beer tours that go from one brewery to the next. Just remember: whether you’re doing a beer tasting at a microbrewery or enjoying a few pints at a pub, don’t drink and drive. Designate a driver, call a cab or take advantage of public transportation.